The Menu contains Figma's search feature and various other functions organized in the menu. Search by name, or browse by general section (e.g. File, Edit, View, etc). If there is a keyboard shortcut for the function you're trying to perform, it will be listed in here as well. The Move Tool (V) is selected by default when you open files in Figma. This tool allows you to select and reorder layers in the Layers Panel, as well as move elements around on your Canvas. Click the drop down icon to the right of the Move Tool (or use the K keyboard shortcut) and you'll find the Scale Tool. In addition to drawing your own shapes using the Pen Tool, there are a number of default shapes you can use in Figma. Click the dropdown menu next to the rectangle to see the available Shape Tools and shortcuts. In Figma, Frames are like Artboards. You can use the Frame tool using either the A or F keyboard shortcut. With the Frame Tool active, you'll be able to select pre-defined Frame dimensions from the Properties Panel on the right. Draw custom shapes and icons with the Pen Tool using Figma's Vector Networks. Use the T keyboard shortcut to add text objects to your designs. The Comment Tool (C) allows you to quickly exchange ideas with other team members. Comments are accessible to anyone with view or edit permissions to the file. Once you've drawn a shape on the canvas, use the Edit Object tool to quickly enter vector edit mode. Clear any overrides you may have added to instances with the Reset Instance button. Design reusable pieces of UI elements by turning them into Components. Hide and show specific portions of other layers using Masks. Combine shape layers through one of four formulas: Union, Subtract, Intersect, and Exclude. Boolean groups are then treated as a single shape. This displays the avatars of other collaborators who are also editing or viewing the same File. Click on a users' avatar to enter Observation Mode and view their actions in real-time. This is great for presentations and design critiques. Clicking this button opens the Share dialog so you can invite people to your File directly, create a public link, copy live embed code, and more. 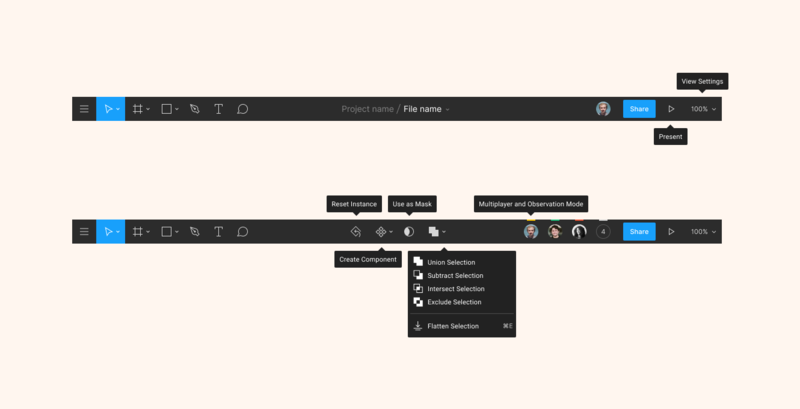 Clicking the Present icon will enter Presentation View where you can view your finished prototypes.